On November 30-December 17, 2017, OISE's Comparative, International & Development Education Centre (CIDEC) collaborated with other Ontario Universities to co-sponsor a lively and engaging conference on Education, Youth, and Peacebuilding in Conflict-Affected Contexts at Wilfrid Laurier University. Notably, this conference drew connections between scholarship and practice within and outside of schools. Kathy Bickmore, Professor in the Department of Curriculum, Teaching, and Learning (CTL), and Director of CIDEC co-organized and co-directed the conference along with Timothy Donais, Professor at Wilfred Laurier University, and graduate student organizers Sara Taylor and Karolina Werner from the Balsillie School of International Affairs. This well-attended conference drew participants and speakers from around the world, including from countries in Africa, South Asia, Latin America, and the Middle East. In so doing, the event provided an invaluable opportunity for OISE faculty and students to present their research, facilitate discussion, and engage with international scholars. The conference highlighted the research of four OISE researchers. In a paper focusing on the experience of youths from marginalized, urban communities in Mexico, Bangladesh, and Canada, Professor Bickmore compared experience- and classroom-based understandings of social conflict and peacebuilding. Elizabeth Buckner, Assistant Professor in the Department of Leadership, Higher and Adult Education addressed refugee education programming in Lebanon and Jordan. A paper by Diego Nieto Sachica, Professor at the Universidad Icesi in Col0mbia and doctoral candidate at OISE/CIDEC, examined current barriers in integrating peace pedagogies with school curricula in Colombia. 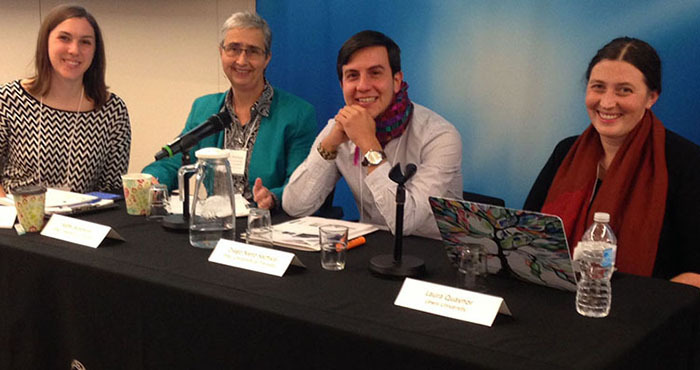 Professor Nieto also presented at a public forum on urban youth identities and the peace process in Columbia. Together with Munir Mehboob (Aga Khan University), Sarfaroz Niyozov, Associate Professor in the Department of Curriculum, Teaching, and Learning, presented on how peace education initiatives in Pakistan have attemted to address challenges of peacebuilding. OISE graduate students were also well-represented among panel Chairs, Discussants, and session Rapporteurs as well as conference attendees. Current and recent OISE doctoral students who served in program roles include Ahmed Salehin Kaderi, Najmeh Kishani Farahani, Rim Fathallah, Angela Guerra-Sua, Yomna Awad, Elena Toukan, Yecid Ortega Paez, Emily Dunlop, Mona Ghali, Neil Orlowsky, and Christina Parker. In addition to seven panels on various topics, the conference featured a public forum on Education, Youth, and Peacebuilding as well as a networking and open discussion session. In both topic and approach, the conference facilitated connections with international scholars on the topic of Education and Peacebuilding and provided inspiration for new directions for research.